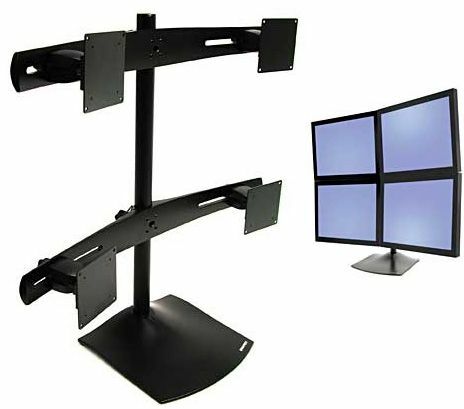 More on the Ergotron DS100 Quad 4 Monitor Desktop Stand for 10-24 inch Screens 33-324-200 below. Fully adjustable screen height, tilt and swivel for easy ergonomics and maximum productivity. A low-profile base, designed to use minimal desk space. A universal design, accommodating various LCD sizes up to 23.25" wide. 2 "Paraview" poles, mounting 4 monitors in a square "quad" configuration. 4 sliding, universal mounting brackets, designed to fit almost any flat screen monitor. 5 year Limited Manufacturer's Warranty. VESA, FDMI, MIS-D, 100/75 and C mounting standard compatibility with a 100x100mm and 75x75mm hole pattern. PLEASE NOTE: Weight capacity may be reduced if monitor is more than 2" in depth. This product conforms to UL specification 1678 tip-test when loaded with all weights of LCDs.